Mt.Everest Expedition is the most daring climbing expedition to ascend the highest mountain of the world Mt. Everest. The Mount Everest is 8848 meters high and lies on the Nepal near the china border. 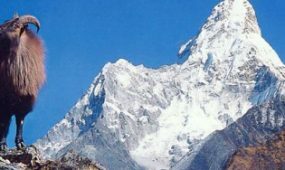 The route from Nepal is easy than route from Tibet so Nepal has become the Everest climbing destination since the first ascend of Sir Edmund Hillary. The Everest region is inhabited by Sherpas who are the mixed society of Tibetan Buddhist practicing the ancient Bon Po civilization of Tibetan Plateau. The climbers going to Everest region take the air-flight to Lukla airport and take a two days walking trip to Namche Bazar. The Namche Bazar is the place for acclimatization for Everest climbers. The climbers after acclimatization follow the trekking trail to Everest base camp at the altitude of 5364 meters on the southern side of Everest. 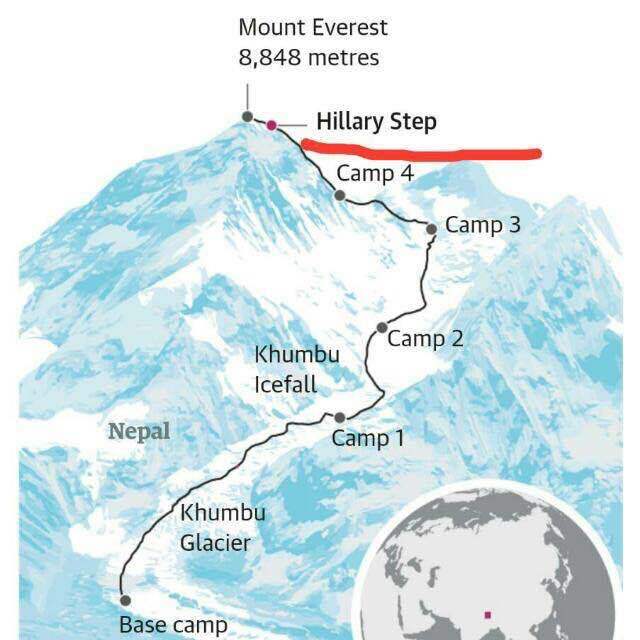 The climbers at Everest base camp are using the southeast ridge of southern face of Mount Everest which is the traditional route. The climbers rest at first base camp fully to overcome altitude sickness. 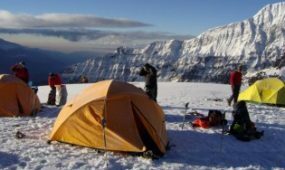 The climbers after start climbing to higher altitude can setup high camp anywhere suitable when needed to rest. The high camps are meant for resting and acclimatization for the climbers to save themselves from harsh climate. The traditional climbing route to Mount Everest has four high camp according to schedule if they are not disturbed by climate. 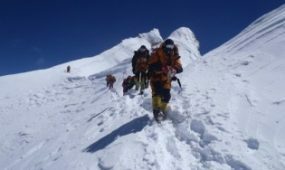 The scheduled high camp setup during climbing of Mount Everest are High-Camp1 at 6400 meters, High-Camp2 at 6750 meters, High-Camp3 at 7100 meters and High-Camp4 at 8400 meters. The climbers follow the regular climbing route to summit and ascend the top. The summit of Mount Everest is the highest peak of the planet and climbers from the top see horizons along with surrounding Himalayas and sea of snow. Upon your arrival in the Kathmandu airport (KTM) you will be greeted by a representative from Nepal Planet Treks and Expedition . After completing your custom formalities (Visa, etc) pick up your luggage and look for our representative with a Nepal planet treks and Expedition display board at the arrival gate. You will be then transferred to Hotel Shanker or a similar category hotel. After check in, you will visit NPT office, meet your trekking guide as well as other participants and do final preparation for the trip. Later in the evening we will organize a “Welcome Dinner” at an excellent traditional Nepalese Restaurant where you will enjoy a Nepalese cultural program along with a fine meal. Sightseeing and Preparation for Everest Expedition. While the leader attends a formal briefing in the Ministry of Tourism, you will explore the fascinating city of Kathmandu. Take rest, familiarize, and make a sightseeing tour to Kathmandu’s World Heritage Sites. We make a guided tour to some of UNESCO World Heritage Sites in the Kathmandu valley: Kathmandu Durbar Square, Pashupatinath, Swayambhu, and Boudhanath. The day will also be for finalizing official procedure and other necessary arrangements. You will be also briefed on the nature of expedition, equipments and team composition. You can also make your last minute buying of personal items as you will be flying to the Himalayas tomorrow. 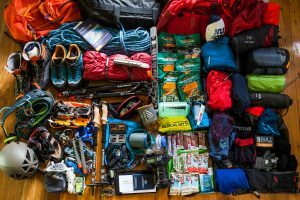 In the late afternoon, the leader will check everyone’s equipment, as Kathmandu is the last opportunity to buy anything missing. You will also get introduced with fellow expedition members and guides. We spend a day in Namche Bazar resting and allowing our bodies to become acclimatized to the altitude of 3,450m (11,300ft).Although a leisure day, it’s important not to remain idle. Health experts always recommend us to stay active and moving during the rest day too instead of being idle. We either spend the day taking a day hike to Thame or visiting Khunde or relaxing and exploring Namche Bazaar itself. Namche Bazaar is the main centre of the Everest (Khumbu) region and has government offices, ATMs, Internet cafes, shops, restaurants, a bakery and a colorful market each Friday evening and Saturday. If we trek a few hundred vertical feet during the day, it will help us to properly acclimatize. Our guides will take us to the Tourist Visitor Center near the headquarter of the Sagarmatha National Park where we can observe an assortment of things related to the first Everest ascenders, Sherpa culture and learn about the various plant and animal life of the Everest region. Contouring along the valley-side and looking down on the Khumbu Glacier, follow a reasonable trail to Gorak Shep. This was the site of the base camp in 1953 and now consists of a few small tea houses. Leaving Gorak Shep, the trail leads onto the moraine of the Khumbu Glacier and becomes quite vague, weaving between mounds of rubble and eventually reaching base camp near the foot of the Khumbu Icefall. This will be our home for the next six weeks. We will return to the welcome haven of the Hotel. Once back in Kathmandu, Nepal Planet Treks and Expedition will host an evening barbecue to celebrate the expedition and as a farewell party to thank the Sherpas for their support and friendship. Climbing boots: Scarpa Phantom 8000, La Sportiva Olympus Mons, Millet Everest One Sports, Kayland 8000. Gaiters: For use with light hiking boots, short and simple are better, such as Outdoor Research’s Rocky Mountain Low Gaiters. Synthetic insulated pants: Primaloft or Polarguard HV fill with full side zips are recommended. Mountain Hardwear Compressor pants are an example. An acceptable alternative are fleece pants Polartec 100 or 200, but they are bulky, heavier and less versatile. Down pants: These are an option in addition to primaloft pants, can be useful at higher camps. One piece climbing shell (optional): One piece shell such as Arc’teryx Alpha suit. Liner glove: lightweight synthetic (Patagonia or any brand of Power Stretch). Mittens with liners: Two pairs, one for summit day (Outdoor Research Alti Mitts) and a utility pair of mittens for hard use in the icefall (Outdoor Research Expedition Mittens with fleece liners).